For some parts of the world, (but not all), today is Valentine’s Day. This is as good an excuse as any to post up some artwork that Everything Dinosaur team members commissioned when they were working on some new children’s t-shirt designs with a dinosaur theme. 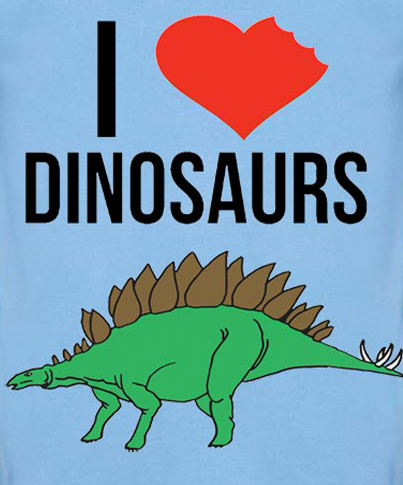 I love dinosaurs! Love in the time of the dinosaurs. Little is known about the courtship and mating habits of non-avian dinosaurs, after all such behaviours are difficult to interpret from the fossil record, but some insight might be gained by studying the behaviour of avian dinosaurs – the birds. Some birds engage in very elaborate and sophisticated courtship displays. In August 2016, Everything Dinosaur published a blog post about a remarkable piece of research, scientists from Poland, the USA, China and South Korea has studied Late Cretaceous dinosaur trace fossils and some of these impressions were interpreted as representing nest scrape displays, as seen in living birds. A model of the Mexican nodosaurid Acantholipan gonzalezi. The evolutionary history of the Fungi – (Kingdom Fungi), toadstools, yeasts, moulds, mushrooms and such like is very poorly understood. These soft-bodied eukaryotes, which are so important when it comes recycling nutrients in ecosystems, have an exceptionally sparse fossil record. Twelve months ago, researchers writing in the on-line academic journal described a very remarkable fossil, that of a mushroom that had been found preserved in Cretaceous-aged rocks from Brazil. Gondwanagaricites magnificus fossil and line drawing. The picture (above) shows a picture of the gilled mushroom (A) and an accompanying line drawing (B). The fossil from the Lower Cretaceous Crato Formation of north-eastern Brazil, represents the oldest fossil mushroom discovered to date and the first to be identified from the southern super-continent of Gondwana. The specimen was collected from the laminated limestones of the Crato Formation, which outcrop on the northern flanks of the Chapada do Araripe in Ceará, (Brazil). Other fossil mushrooms, (Class Agaricomycetes, Order Agaricales) are preserved in the fossil record, but these fossils are associated with amber inclusions, all of which relate to younger material (Mid-Cretaceous to Miocene amber). The genus name for this remarkable discovery (paper published in 2017), is derived from Gondwana and the Greek “agarikon” meaning mushroom. 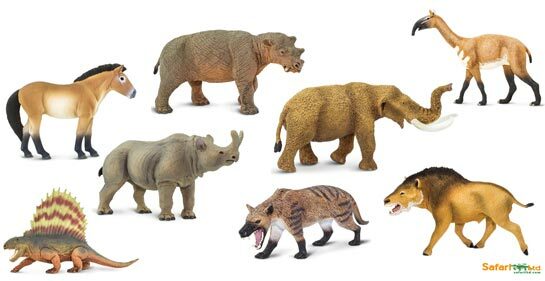 The species epithet is from the Latin, meaning splendid or magnificent, a reference to the remarkable state of preservation of the specimen. A correction to the original paper, concerning the correct nomenclature to be used when referring to this amazing example of a fossilised fungus has just been published. 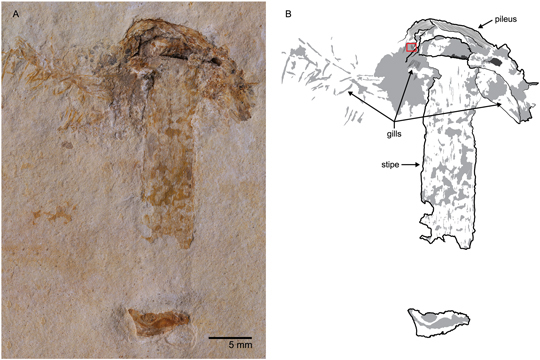 The Crato Formation, might be more famous for its Pterosaur fossils, but the preservation of a gilled mushroom in this Lagerstätten is nothing short of astonishing.